For Miller Garages, every garage is a custom garage. 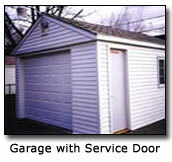 As one of Michigan’s most experienced and versatile garage builders, Miller Garages has the know-how to make every garage unique and suited to meet each customer’s unique needs. 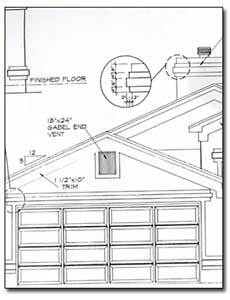 Miller Garages starts planning your custom garage with one of five types of garage designs, based on the roof type or the garage construction materials. 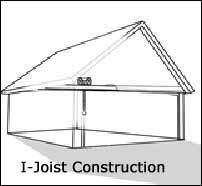 I-joist garage construction — ideal for the homeowner with extra garage storage needs. The strength of the I-joist wood beams in the floor allows the structure to support the weight of additional storage space above. Balloon garage construction — another option for extra garage storage space and strength. The additional capacity on the upper level is supported by continuous wall studs that run the entire height of the structure. 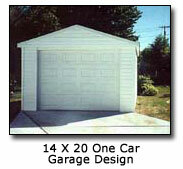 From each of these garage designs, Miller Garages can create custom garage plans to meet your needs. Any capacity. The sky’s the limit on the size of the garage. Whether the garage will hold only the family car and some lawn equipment or your entire classic car collection, Miller Garages can create a custom garage for you. Any storage. If you can’t part with the family treasures but can’t store them in your house either, Miller Garages can create garage plans that safely tuck them away. If you have recreational vehicles that need to be stored off-season, Miller Garages can create a garage to keep your “toys” secure until they’re ready to be used again. Any style. Miller Garages helps you select a garage design for a new building that will complement the appearance of your house or other existing structures. 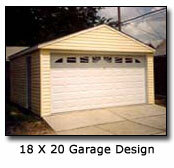 We can also expand an existing garage with matching materials and styles. Whether building new or enlarging, Miller Garages helps you choose the right building material and colors, select the most functional garage door, and identify windows and pleasing exterior décor. 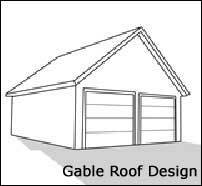 The gable roof design is the standard garage roof type. 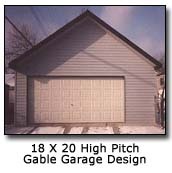 Miller Garages often suggests a gable roof when the garage is visible from the street and needs to blend in with a gabled house. 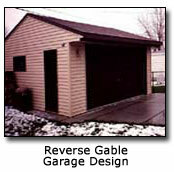 In the gable roof garage design, the roof has two sides that are pitched (not flat). The two parts of the roof meet at the top and slope down to the eaves, forming two vertical, triangular-shaped, peaked gables at the ends. Gable roofs let the snow and rain slide off easily toward the ground. In the standard gable design, one of the gabled ends faces the front. 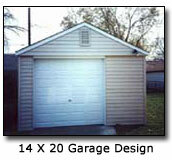 In a Miller Garages custom garage, the gables can be small or large. With larger gables — typically used with a two- or three-car garage — you can insert windows and external décor touches that blend in with the house or other nearby structures. 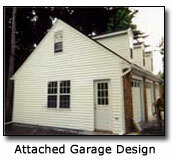 Miller Garages also designs custom garages using variations on the standard gable roof, such as these. Cross-gable roof: For a larger structure, a cross-gable roof — two gable roofs perpendicular to one another — might sit atop a spacious garage that shelters multiple vehicles. Dutch gable roof: A stylish garage may sport a Dutch gable roof, each side of which is highly sculpted and surrounded by a pediment (a triangular architectural design element). Salt box roof: A salt box roof built onto a gable roof provides an extension that can cover a shed or other storage space at the side of the garage. Shed roof: Another option for covering a storage space at the side of the garage. A shed roof is a separate roof that starts at the eaves of the garage roof and extends over the storage space at a lower (flatter) pitch. 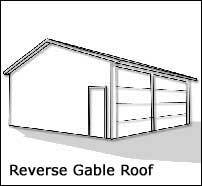 Gambrel roof: When additional second-floor storage space is needed in the garage, a gambrel roof may be the best option. A gambrel roof slopes more gently toward the eaves, at different angles. Gambrel roofs are often used in rural settings, but can also contribute to unique garage plans for urban areas. Kicked eaves: Gable roofs may be enhanced by extended, or kicked, eaves. This gives the garage a "visor" effect. In garage construction involving a reverse gable design, the triangular gables face the sides rather than the front. The long sloping roof is visible at the front and may be inset with dormers (windows set vertically on the sloping roof that have their own roofs). Miller Garages constructs custom garages that use the reverse gable roof design in a variety of sizes and styles, to complement the look of the house or other nearby structures. 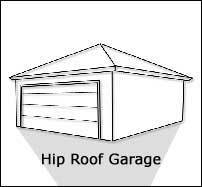 When the garage construction requires extra capacity for storage or extra sturdiness due to weather conditions, Miller Garages may suggest a hip roof. A hip roof is a pitched (not flat) roof with four sides, all of which slope down to the eaves, usually with a gentle (not steep) slope. The hips are the lines at which any two adjacent sides of the roof meet. Hip roofs are stronger than some other roof types because of the wood trusses (framework of beams, like ribs) that support their shape underneath. Hip roofs let the snow and rain slide off easily toward the ground. Pyramid roof: Simple garage designs can be created from a pyramid roof, in which all the sides of the roof are the same size and meet in the center. Cross-hip roof: For larger garage structures, the cross-hip roof stretches across multiple sections, each with its own hip profile. Mansard roof: A mansard garage roof slopes down to the eaves at two angles, with the lower slope steeper than the upper one. A mansard roof on the garage can match a similar style on the house. I-joists (I-beams) may be the right choice for building a garage with extra storage space above the car. I-joists can be used in any garage design, to strengthen the floors so they support the additional weight of upper-level storage space. When I-joist wood beams are used, the garage sub-floor (under the concrete) is built mainly from wood beams shaped like the capital letter "I". In an I-joist, the flanges (ribs or rims) form the top and bottom of the wood beam, just like the short top and bottom of the "I". The web, or center, of the beam (the long part of the "I") can be cut with holes for ducts and wiring. I-joist beams add strength to the garage’s first level, to help it support the weight of additional storage space on the second level. I-joist beams can also be used in the base of the second floor, to support the items stored there as well as to help bear the weight of the roof. Wood I-joist beams are strong and straight and produce garage floors of superior strength. They are stronger, stiffer, and lighter in weight than wood that is sawn and are available in lengths of up to 60 feet. These long, sturdy beams are well suited for the open, weight-bearing floors of garages, especially in the larger two- and three-car garage designs. When even stronger garage construction is needed, extra I-joists may be added to support additional weight. If you’re planning an apartment above the garage, I-joists may be the material of choice for the apartment floor. I-joist webs are built to accommodate holes for the wiring, plumbing, and other ductwork required for that garage design. In addition, many finishing options are available for the garage ceiling underneath the apartment floor. In many garage designs, I-joists are also used in garage door headers, as the beams over the garage door. Using I-joists in the garage door header provides the additional strength and firmness needed so the garage construction can withstand the pull of the garage doors over time as they open and close. 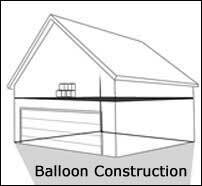 Balloon framing construction is an option for strengthening garage walls to support upper-level storage space. Balloon framing can be used in any garage design. In balloon framing, each wall stud is a single, continuous piece of lumber that runs all the way from the floor of the garage to its roof — the entire height of the building. This produces stronger walls than the more common construction method, in which each floor is separately constructed and separate, shorter studs are used for the walls in each level. Balloon framing is also used to extend the height of the garage walls, to create additional storage capacity. Balloon framing can support additional height for extra garage storage and additional strength in windy conditions. 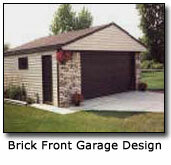 Call us at 248-955-4092 for an initial consultation, so we can help you select the best garage design for your needs. Or email us by clicking on this link: New Garage Estimate.